This entry was posted on February 2, 2015 by darkenergydetectives. It was filed under DECam Images, English, Ingles . That was a good explanation, Josh. Thank you for it. Keep up the good work. I enjoy reading about the progress of the teams. I worked with the education office at Fermilab from 83-92. I taught physics at St. Charles and directed the Summer Institute for Physics teachers. It was a great place to work. Hundreds of millions of MPH? My calculations show the speed of light to be on the order of 670 million mph. If gravity doesn’t slow it down, would not the limit of the speed of light slow it down? 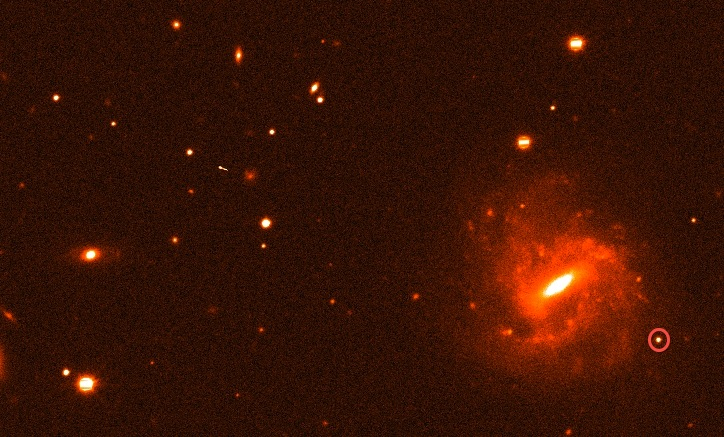 These galaxies are moving through space, but also space is expanding. The patch of space in which a galaxy l sits is moving away from us. Therefore, you can combine the velocities. Things can not move through space faster than the speed of light, but patches of space themselves have no speed restriction. So, if space is moving very fast, and carrying a galaxy with it, the galaxy can be moving faster than the speed of light away from us. The speed of light limit only applies to things moving through space. This, cursorily, is the context of Special Relativity. The movement of space itself is in the purview of General Relativity, where there are no restrictions on the velocity of space itself.